Named one of the Top 100 Business Luminaries of the Century by TJFR Group and MasterCard International. In 1988, Mr. O’Neil was featured in the book Market Wizards by Jack D. Schwager. In 2002, William O’Neil receives the Classic Award of Recognition from the AeA, the largest high-tech industry group in the United States. In 2004, The Stock Trader’s Almanac devoted its 37th edition to Mr. O’Neil. In 2005, William O’Neil received the prestigious Spirit of Lincoln award from the Lincoln Club of Los Angeles, recognizing him for his significant contributions to society in his research and efforts to develop a plan for jump-starting the American economy. In 2012, Mr. O’Neil founded the William J. O’Neil Foundation for charitable, literary, and educational purposes. In 2016, Mr. O’Neil was named one of the Most Influential People in Los Angeles by The Los Angeles Business Journal. In 2018, Mr. O'Neil was presented with The CMT Association's Lifetime Achievement Award in recognition of his work advancing the discipline of technical analysis. William J. O'Neil is one of the true great American success stories – the foundation of our heritage at William O'Neil + Company. Born in Oklahoma and raised in Texas, Mr. O'Neil began his career as a stockbroker in 1958 with Hayden, Stone & Company, an established stock brokerage firm at the time. His fascination with the securities market led him to develop his own computerized study of what made stocks successful. From his research, Mr. O'Neil pioneered and developed the use of historical precedent to analyze equities in tandem with fundamental and technical analysis. Drawing from these discoveries, he created his own investment discipline, the O'Neil Methodology (OM), focusing on the trends and patterns of stocks as they became top performers or underachievers. He identified seven basic factors that occurred over and over again in almost all top-performing companies as studied over eight different market cycles. He quickly became the top-performing broker in his firm. After a 20-fold increase in his own account in 26 months, Mr. O'Neil branched out on his own and founded William O'Neil + Co. Incorporated in 1963. Mr. O'Neil purchased a seat on the New York Stock Exchange at the young age of 30. In 1971, he summarized, adapted, and published his findings as The Model Book of Greatest Stock Market Winners, which was the basis for the OM. In 1972, Mr. O'Neil copyrighted the unique format he had created to capture all the relevant information he needed to make an investment decision about a stock, which he called a Datagraph™. To help provide individual investors with charts and information for their investment research, he founded Daily Graphs, Inc. (later MarketSmith, Incorporated). Realizing the need to deliver his time-sensitive information ahead of the competition, in 1973 Mr. O'Neil founded O'Neil Data Systems, Inc. (ODS), a high-speed printing facility that pioneered the field of database publishing using state-of-the-art computer technology. 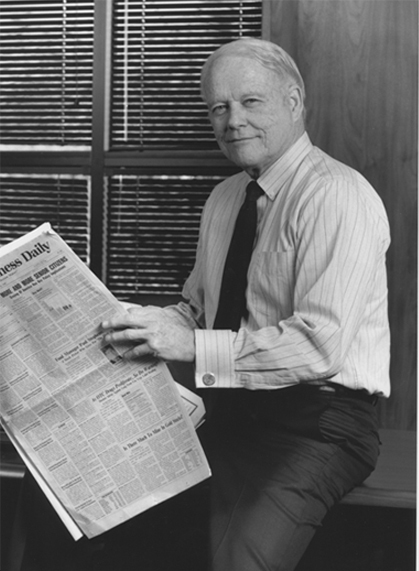 In 1984, Mr. O'Neil designed and launched Investor's Daily (later renamed Investor's Business Daily®), the first national business newspaper to compete successfully with The Wall Street Journal. Mr. O'Neil used his years of experience in economic and business research and his massive historical database to fill a daily information gap that existed for the individual investor. In addition to being a successful entrepreneur, Mr. O'Neil is a successful writer, authoring several best-selling books on investing in the stock market. Mr. O'Neil's book How To Make Money In Stocks: A Winning System In Good Times Or Bad, published by McGraw-Hill, is in its fourth revised edition and was the best-selling investment book of 1988. It has sold more than 4 million copies worldwide. Mr. O'Neil also wrote the bestseller 24 Essential Lessons for Investment Success and The Successful Investor, authored in 2004. In 2005, he was asked to write the foreword for Edwin Lefevre's popular Reminiscences of a Stock Operator Illustrated Edition.